Volunteers are the heart of Family Promise. Our dedicated volunteers help us provide shelter, meals and other assistance to homeless families for about one-third the cost of traditional shelters. Family Promise keeps families together and provides them with a safe, supportive and home-like environment. But our volunteers do so much more. They become a personal support system to homeless families in the network. They share contacts for jobs and housing, help write resumes and prepare for job interviews, donate clothing and furniture. These supportive relationships often continue after families leave the network. Because of the involvement and dedication of our volunteers, more than 80 percent of the families we have assisted have found permanent homes. Family Promise has two constituencies. Families in need, to be sure, but we also present the opportunity for compassionate people to make a difference in their community. We offer a wide range of volunteer activities to fit varying schedules and levels of commitment. 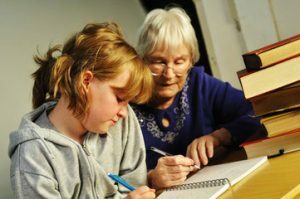 Our program allows families to volunteer together, from grandparents to young children. If you are interested in volunteering for Family Promise please contact us here.